All Day Supermarket makes grocery shopping a family experience by incorporating "paluto" dining. So after buying groceries you need for home, you can sit down and dine. The items displayed are somewhat similar to membership shopping stores like S&R and Landers or those which offer imported goods. But you will still find local brands too. Take a look at the pile of spicy noodles below! Or this shelf of Korean beer, soju. Apart from the usual grocery items, there's a section upstairs on the second floor for other home products like kitchen aides, beddings, RTW, furniture, appliance, and more. They also accept bills payment for major utilities. This branch is also close to the Villar Sipag compound where there are more restaurants to dine. Some time ago, they even hold night food market events (dubbed Calle Mercado). I'm not sure if that has stopped. The area has a church closeby too. 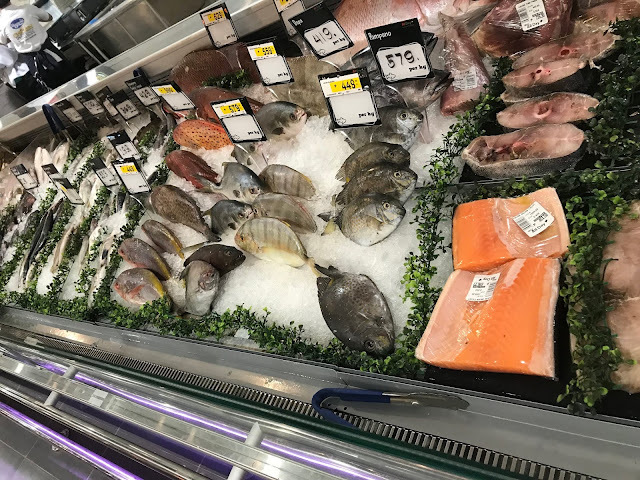 First off, paluto is simply a local term for choosing what products you'd like cooked, fresh from display, instead of the usual readily available menu items from restaurants and then selecting how the items are to be cooked. It's quite convenient that the stalls for paluto have an instruction guide. See the "how to paluto" banner. It says start by selecting what kind of dish you'd like from the available options listed or request something else that's not listed. I guess the latter will depend on the chef's knowledge or the availability of ingredients used for that dish. I'm not sure if all the stalls are part of the supermarket or if they are individual consignees renting but they all have their own specialty cuisine, i.e. Filipino, other Asian, hot pots, seafood, steak and so on. So the menu will be dependent on which stall you'd choose. The stall will often tell you which specific ingredients to buy. You can them at the area specified for paluto or even the wide supermarket area. It was for this purpose that you are supposed to select the cooking style first before buying anything. One of those seafood sample pictured, along with a slab of cheese, separately purchased, became a platter of mussels in garlic and cheese. Chicken was cooked with soup stock and some vegetables just to deal with the chill. It was really cold inside the supermarket but it wasn't smelly at all, despite all the cooking or grilling done. The food was good but it's a bit pricey (mid-range level). All Day Supermarket stores are mostly located close or within Vista Land, i.e. residential communities like Camella, Crown Asia and other Vista Land properties. Some of the known branches are located in Las Piñas, Taguig, Muntinlupa, Mandaluyong, Makati and Cavite (Kawit and Bacoor). You'll find more information about them through their Facebook page, https://www.facebook.com/pg/AllDaySupermarketPH or their official website http://www.allday.com.ph (site currently down as of this post).